Last week, I blogged about Facebook’s embrace of pain today, gain tomorrow type behaviour—something I’m always on the lookout for. Today, I’ll focus on perhaps the most important question mark about its future. First, some housekeeping. For the rest of this post when you see the word Facebook it’s referring to the social media site and app with 1.5bn addicted users worldwide (or 2.2bn if you count the more occasional user too). The term Facebook Inc., however, refers to the company that owns Facebook, plus Instagram, WhatsApp, Facebook Messenger and more. The difference is important. Today, Facebook is not a magnet for the young and hip. Everyone’s mum and grandpa are on the app. So is it really going to be a place for under 30s to conduct their main public online interactions? The under 30s crowd is seemingly all marketers really care about. As Facebook loses that cohort they’ll lose those dollars. At least that’s the bear argument. Firstly, it doesn’t make Facebook a bad asset, there’s plenty of money to be made off us oldies. It isn’t growing the user base in North America. But that’s because more than half of the total US and Canadian population are already counted as a daily user. The platform is still growing in most of the rest of the world. If you can see any substantial impact from the #QuitFacebook and #DeleteFacebook movements of early 2018, you’ve got sharper eyes than me. 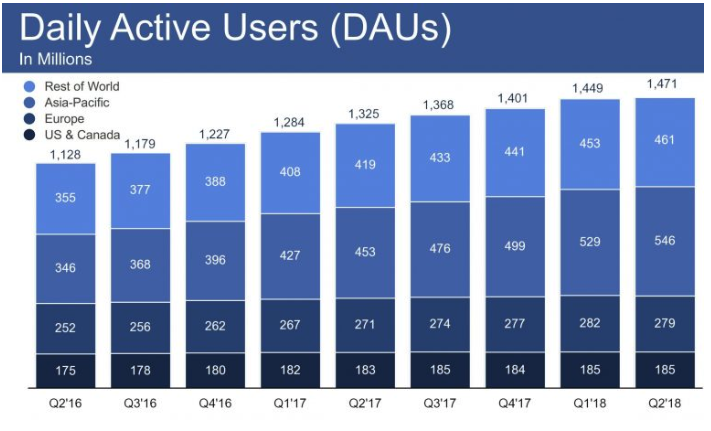 Revenue per user is growing too, on a seasonally adjusted basis (the 4th quarter is always the strongest in North America and Europe). There are, however, some important kinks in the way the company presents the numbers. 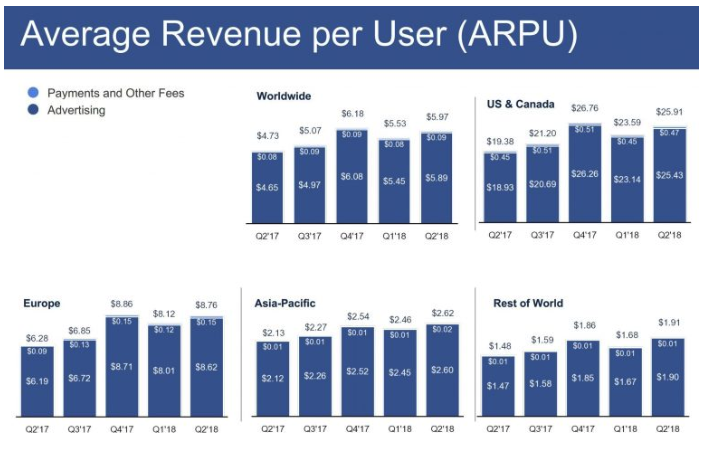 The quarterly Average Revenue per User (ARPU) number the company provides is a mythical construct. The numerator is Facebook Inc’s revenue from all sources (mainly Facebook and Instagram) from each geography. The denominator, in contrast, is the Monthly Active Users count in that region of Facebook only. The chart does however make pretty clear that even if Facebook has a problem, Facebook Inc. does not. Kids, which I define as anyone under 30, evidently aren’t flocking to Facebook anymore. And it’s inarguable that Facebook would be worth more if the young-uns were on it. The salient question is, what are they using instead? The answer, until recently, appeared to be Snapchat (NYSE:SNAP). That was a problem. But the answer now is overwhelmingly Instagram. ‘Insta’ has been growing like a weed. Facebook Inc owns Instagram. Problem solved, for now at least. 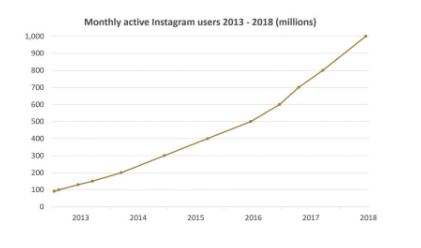 Instagram now has 1 billion active users (and growing), versus 188 million for Snapchat (and shrinking). Not only are younger people flocking to Instagram, they’re spending more time on it. According to SimilarWeb, as recently as September 2017 U.S. Android users were spending less than 30 minutes a day on the platform. By June 2018 it was around 55 minutes, a similar figure to Facebook itself. This is the direct result of an important pain today, gain tomorrow decision by management. Instagram Stories is a shameless rip-off of a similar feature on Snapchat. And the company has pushed it over the traditional Instagram Feed layout, despite it being harder to monetise. But, over time, monetise it will. Attention is a very valuable asset. Instagram is in unique position. Advertising works best when the right users are targeted when they’re in the right frame of mind. Both elements matter. When I first started working for the Intelligent Investor stockmarket newsletter in the early 2000s, the best source of new customers was expensive full-page advertisements in finance magazines like Shares, Smart Investor and Money. They paid for themselves, and then some. Right target market, right frame of mind. We occasionally tested much cheaper advertisements in other magazine mastheads in areas like caravans, cruising and senior travel. Right target market, wrong frame of mind. Those ads always flopped. Talk to a younger person about their discretionary shopping habits. Many of them will tell you that most of the clothes they buy were first spotted on Instagram. Look over their shoulder on the bus (yeah, I’m that guy), a good proportion of them will be on Instagram looking at clothes or interiors or hairstyles. That’s exactly when the smart retailers, hairdressers, surfboard shapers and craft brewers want to reach them. Simple economics dictate that the closer to a transaction that the advertising medium sits, the more advertisers will pay to use it. Untargeted impressions are confetti. Targeted impressions are worth a little more. Click throughs are worth a lot more. ‘Buy Now’ buttons, they’re gold. Instagram sits closer to the transaction than any other social media site. And they’re moving closer. 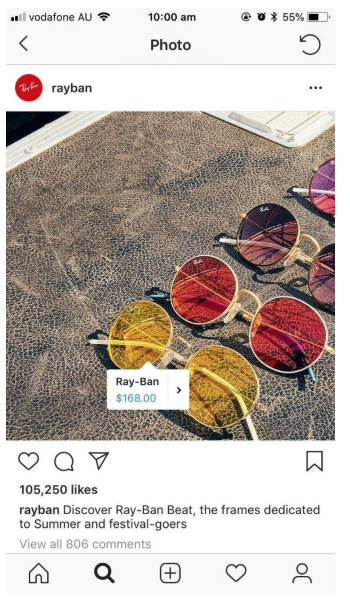 At the swipe of an image you go from an Instagram photo of someone wearing a pair of jeans you like directly to a store website selling those jeans. In recent months Instagram has been experimenting with native payments. You give Instagram your credit card details just once and can then shop from a myriad of providers. I’m sure users will soon be able to add addresses, shoe size and never leave the Insta app. This function is likely to morph into the social media equivalent of Amazon’s 1-Click ordering. Facebook Inc doesn’t separately report Instagram’s revenues. Bloomberg Business suggested it generated less than $5bn in revenue in 2017, perhaps 12% of Facebook Inc’s total revenue. In contrast, Morgan Stanley pegged the 2017 revenue at more than $10bn, or 25% of company-wide revenue. The wide divergence of guesses suggests management have been impressively tight-lipped on the matter. There’s no pinpoint accuracy here. But it’s correct to say that Instagram’s revenue is significant and that it is growing rapidly. My guess is north of 50% per year at present. While it can’t grow at that clip for long, Instagram revenue is almost certain to grow dramatically over the next 5 and 10 years. It could one day be worth more than Facebook itself. I haven’t even touched on WhatsApp’s 1.5bn users. Nor the 1.3bn who use Facebook Messenger. If the Chinese example is anything to go by, these services could ultimately be central to the world’s payment systems. For the lot, $500bn could still be cheap. Hi Gareth, is Forager buying the stock in the international fund ? No we don't own it yet James but it's firmly on my watch list.